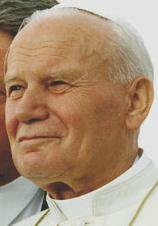 Pope John Paul II beatified more people than many of the popes before him put together. Beatification (from Latin beatus, blessed, Greek μακάριος, makarios and Latin facere, make) is a recognition given by the Catholic Church of a dead person's accession to Heaven and power to help people who pray in his or her name. Beatification is the third of the four steps in the canonization process. A person who is beatified is given the title "Blessed". Beatification Facts for Kids. Kiddle Encyclopedia.